Last year I had the privilege of playing Ebenezer Scrooge for the Front Range Theatre Company's "The Education of Mr. Scrooge." I was also asked by the Castle Rock Chamber of Commerce to write a brief history of Castle Rock's "Starlighting" ceremony -- a longstanding tradition for my home town. So I wrote a script, a skit, really, to tell the story. Originally, my "character" was Scrooge, and I wound up with a plug for the play. This year, the Chamber fiddled with the script to make me "Horace Ebenezer." But I thought putting this online somewhere might make for a nice bit of local history. My thanks to the many real life officials who performed this last night. The usual big Starlight crowd seemed to enjoy it, hokey though it was. I should say, by the way, that I've got a heck of a cold, or flu, or something. So I hope I did my part OK. But the advantage of writing the script is that you can give everybody else the long bits. In the picture below, Gary Shapiro is on the left. I, wearing an awesome Mad Hatter hat, am on the right. Jamie LaRue—(Ebenezer)--"Why is there always such a fuss downtown in Castle Rock, every year, just to turn on a showy star that wastes taxpayer dollars? Humbug!" Gary Shapiro—“At that moment, a Voice chimed in--Ebenezer, you will be visited this afternoon by three Spirits." Just then the Perry Street clock struck ONE. And almost immediately, another voice materialized, this one accompanied by a body and a beard." Commissioner Boand—“In 1965, an enthusiastic group of citizens worked with the Volunteer Fire Department to prepare an inspirational ceremony to accompany the turning on of the lights. The first Starlighting Ceremony took place on Sunday, November 28, 1965. And so it has continued, so that 'the Yuletide travelers who pass along this way between the hours of dusk and dawn may know that this star, so like that other Star of long ago, radiates its warm and sincere message of Hope for Peace on Earth and Good Will in the Hearts of Men.'" Commissioner Boand—“Originally the dream of Golden Dobbin owner Anne McConnell, it was adopted as the joint vision of the Castle Rock Chamber of Commerce and the Town's Fire Department. Gary Shapiro--Then the clock tolled Two. And the Second Spirit appeared. Jamie LaRue—(Ebenezer)—“Has anyone ever told you you look just like the Mayor of Castle Rock? 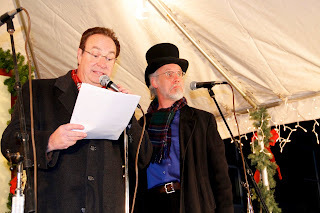 Mayor Donahue – “Yes, Ebenezer, Santa will be here tonight, as he has been so often before. Actually here is the Santa Chair—we will be seeing him very, very soon”. Jamie LaRue—(Ebenezer)—“So all of this is just a government boondoggle to sing old songs, visit Santa, and eat chili? Rep. Murray—“We create community. From our shared experiences, our gathering with children, our hopes for the future, we build an enduring and inviting Town, truly an inspiration, a light, for the entire state."